A local swimming pool and camp site has re-opened its doors after suffering extensive damage in the 2015 floods. The volunteer-led Lazonby and District Swimming Pool received £5,393 from the Cumbria Flood Recovery Fund to make essential repairs to the pool, camp site and play area, including replacing the damaged electrics, main fuse box and pool machinery, and repairing fencing. The facility provides a sociable place for people of all ages to use, and is a vital community hub throughout the summer season for local residents. 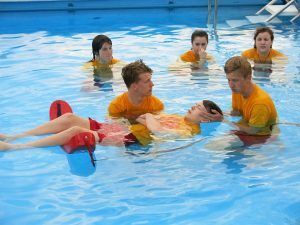 The pool is used by the people of four local parishes in an area where there are few alternative amenities, and local schools rely on its availability for daily swimming lessons, at a more affordable cost to them than using the larger leisure centres. The funding meant the pool and camp site could re-open for the 2016 season. 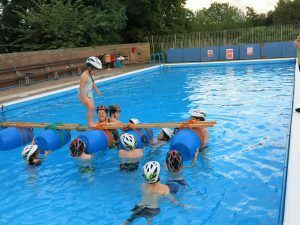 New activities at the pool included a series of six 2-hour water based activity sessions – water ball games, raft and bridge building, and a ‘Swim Eden’ Challenge set up with the other 3 outdoor swimming pools in Eden. Jill Eastham, Chairperson of the group, said: “Without the funding the swimming pool and camp site would not have re-opened. This would have been a huge loss to the community as the pool is used for a variety of activities throughout the season by both locals, visitors from other areas of Cumbria and tourists to the area.